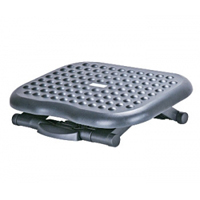 The Relaxing Footrest non-skid platform includes acupressure 'bumps' which can be used to massage the feet of the user. The Relaxing Footrest is a height adjustable platform with 3 height settings - 4.53", 5.79", and 6.3" and is also free floating at each height setting, accommodating the desired angle at the ankle - either positive or negative. Note: This platform cannot be 'fixed' at a desired angle.